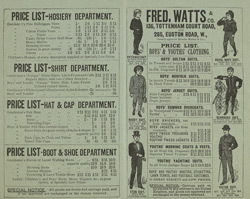 This is an advertisement for Fred Watts and Co, a men's clothing store. Cutting out a garment is the most difficult and highly skilled of the tailor’s craft and well fitting suits and jackets became highly prized possessions. The three piece suit was the basis of the male wardrobe in the 19th century, and this was because there was a rise in the number of men working in the professions, and the increase in the number of people working in offices. Until the end of the century all the pieces of the suit were made from different materials, and it was common for the trousers and the waistcoat to differ from the coat in both colour and fabric. In the mid 1800s it was fashionable for gentlemen’s trousers to have a brightly coloured and checked pattern which were worn with a plain jacket.